Commerce is a district in Los Santos, San Andreas. It surrounds the area of Pershing Square. 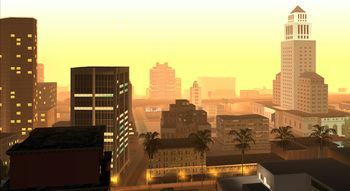 North of Commerce is Downtown Los Santos, while south of Commerce is Verdant Bluffs. West of Commerce are Verona Beach, Market and Conference Center, while to the east are the districts of Little Mexico and Idlewood. As the name suggests, the district is a commercial district; a lot of businesses and office buildings are found in this area, and there are almost no residences found in the area. Commerce is based on the Civic Center and Commerce districts of Los Angeles. The location of Commerce on the map, seen here highlighted yellow.